It is a wonder how many talented and important people of all ages had more than a casual connection with Winston Churchill. They ranged the world, with different professions and callings too diverse to enumerate. One of the most unlikely was Mark Twain, with whom Churchill shared more than the genius of a great writer. 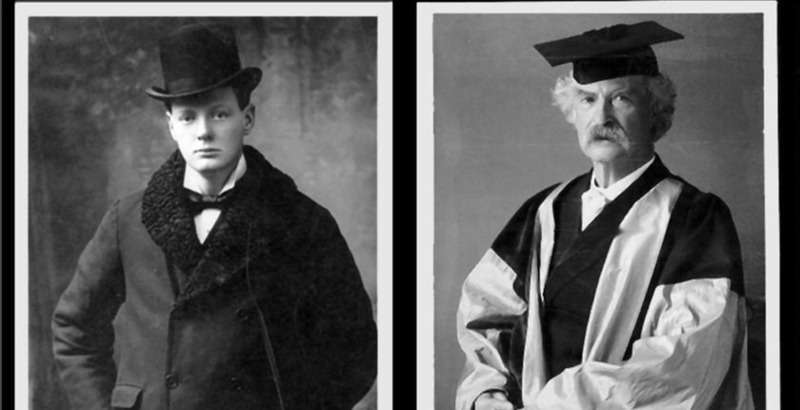 Churchill and Twain were accomplished speakers. Both loved to talk, to small and large audiences. They were were prodigious authors. Both worked from bed.1 Each experienced bouts of melancholy. Both traveled the world, but loved the comforts of familiar surroundings. They dressed the part they played to dramatize their unique self-images. Coincidentally, they were born on the same day, November 30th, thirty-nine years apart. Churchill, who doted on Twain’s books as a boy, was born to, was born to, yet often mocked, the British establishment. Twain seemed born to annoy and mock the American Establishment. Each admired the other’s country. After escaping, Churchill rejoined British forces and took part in the successful attack on Pretoria. He turned his newspaper accounts into his fourth and fifth books, London to Ladysmith via Pretoria and Ian Hamilton’s March. His fame quickly led to a lecture tour in North America—and to another encounter with Mark Twain. The soldier-turned-journalist hoped to earn £5000 to support his new career as a Member of Parliament (at the time unsalaried). On a wave of patriotic fervor in the October 1900 “Khaki Election,” the ruling Conservatives were returned to office. Churchill was among them, now MP for Oldham, hoping to follow in the footsteps of his deceased father, Lord Randolph Churchill. The English loved Twain in return. At an 1872 London dinner, a list of the guests was read in silence until his name was mentioned. Then, he wrote his wife, “there was such a storm of applause as you never heard.”21 Lionized by the British elite, he loved the English countryside. “England is the most beautiful of all countries,” he wrote.22 With his distinctive recognizable visage and memorable wit, he became for many Britons the archetypal American, much as Benjamin Franklin had been for the French a century before. As a rule, Twain disdained politicians. His co-authored novel, The Gilded Age, satirized the corruption of politics and business in Washington. But again like Churchill, Twain was never a prisoner of convention, even his own. He had overseen publication of the memoirs of a politician, Ulysses S. Grant, saving the family of the dying Grant from bankruptcy. A decade later, Twain’s own finances were rescued by the astute management of his good friend Henry Rogers, the powerful vice-president of Standard Oil. For years I have been a self‑appointed missionary, and have wrought zealously for my cause—the joining together of America and the motherland in bonds of friendship, esteem and affection—an alliance of the heart which should permanently and beneficently influence the political relations of the two countries. Wherever I have stood before a gathering of Americans or Englishmen, in England, India, Australia or elsewhere, I have urged my mission, and warmed it up with compliments to both countries and pointed out how nearly alike the two peoples are in character and spirit. In the 1890s, when Samuel Clemens was entering his early sixties, his own finances collapsed. His investment in the Paige automatic typesetting machine proved a financial sinkhole. His publishing company added to his financial losses. Only the assignment of his copyrights to his wife saved him from complete collapse. Once he declared bankruptcy, but pledged to repay his creditors in full. Careless in many personal affairs, Clemens like Churchill was scrupulous when it came to copyrights. He was infuriated that his early works were published in Britain without compensation. His first visits to England were made in part to forestall such shenanigans. Like Twain, Churchill was shrewd about making money and careless about spending it.37 But when it came to compensation for speaking or writing, both managed their affairs meticulously. Twain’s publication contracts at the end of his life called for him to be paid by the word—and he scrupulously counted them. A biographer recorded Twain’s income as high as $200,000 per year. He was the highest paid writer in America, and it was widely reported that his magazine contributions could earn a dollar a word…. “His last contact with Harper & Brothers guaranteed him only a third of that, but it was still a better deal than anyone else could have expected, and he always insisted on a strict word count from his editors, even going so far as to demand that hyphenated words be counted as two.”38 Clemens campaigned energetically to preserve his copyrights. When he began his writing career, there was no barrier in England against unauthorized printing and sale of his work. “Clemens found this state of things unacceptable,” a biographer wrote. “The idea of being denied reward from his labor, while other people enriched themselves from it, outraged him, and he would pursue the battle for authors’ rights throughout the rest of his life.”39 Similarly, after World War II, Churchill carefully arranged the rights and optimum tax status for his publications before he ever began writing his war memoirs. Samuel Clemens married Olivia Langdon in 1870 when he was thirty-four. Winston Churchill married Clementine Hozier in 1908 when he was thirty-three. Both wives were valuable confidants, willing at times to speak unpleasant truths about personal and political affairs. Like Clementine Churchill, Olivia Clemens worried about family finances. But while Olivia oversaw the construction of the family residence in Hartford, Connecticut, Clementine could only lament Churchill’s insistence on pouring money into their Kentish home, Chartwell. Its purchase was the only acquisition he’d ever made without her approval, and its expansion was largely to his tastes. In the Churchill family, most of the fireworks revolved around the spoiled only son, Randolph, who often irritated and embarrassed his father. Clementine once wrote her husband, “one shrinks from saying anything to Randolph because one wishes to avoid a scene.”44 A brilliant journalist, Randolph sadly became an alcoholic who died aged only fifty-seven. Diana, the eldest Churchill child, suffered from emotional problems and depression, eventually committing suicide at fifty-four. Of the children of both families, only Clara Clemens (88) and Mary Churchill (91) survived to a ripe old age. John Marshall Clemens had died of pneumonia when his son Samuel was just twelve years old. Lord Randolph Churchill died, probably of a brain tumor, in 1895 when his son Winston was twenty-one. Sam’s father left the family penniless, Randolph left a pittance. We must leave it to more practiced scholars to judge how the melancholy of both Churchill and Twain was affected by family tragedy and disappointment. On the plus side, both Churchill and Clemens had brothers who played influential if understated roles in their lives. Orion Clemens, ten years older than Sam, was unsuccessful at most things he tried—law, politics, inventing, farming, journalism. His failures (and need for Twain’s financial support) came to plague his younger brother.45 Jack Churchill, five years younger than Winston, was quite the opposite: a successful financier but living content in his brother’s shadow. Jack was wounded in the Boer War, “his baptism of fire,” Winston wrote. “I have since wondered at the strange caprice which strikes down one man in his first skirmish and protects another time after time….Outwardly I sympathised with my brother in his misfortune, which he mourned bitterly, since it prevented him taking part in the impending battle, but secretly I confess myself well content that this young gentleman should be honourably out of harm’s way for a month.”46 Jack later served honorably in World War I. During World War II, he lived at Downing Street, ever the loyal and supporting brother. He died in 1947, beloved by his family. In May 1897, Twain famously wrote that a “report of my death was an exaggeration.”47 Having long smoked and drank to excess, the great author became increasingly troubled by heart disease. Born with the arrival of Halley’s Comet, he predicted he would “go out with it.” Indeed he died on 21 April 1910, aged seventy-four, the day after the comet reappeared. Yet he outlived most of his friends and family. Churchill would live another fifty-five years. Sharing the same birthday as Clemens, he too was born and died in odd conjunction. Having predicted he would share the day of passing with his father, he died on 24 January, exactly seventy years after Lord Randolph. Although Churchill wrote only one novel, his literary output would eventually exceed 15 million words. Surely, Samuel Clemens would have envied such impressive production as the basis for literary compensation, and negotiated accordingly. Lewis E. Lehrman is the author of Churchill, Roosevelt & Company: Studies in Character and Statecraft (Stackpole, 2017) and Lincoln and Churchill: Statesmen at War (Stackpole, 2018). 1 In World War II, Churchill sometimes seen in his Chinese dragon dressing gown. Mark Twain dictated part of his autobiography from bed, in a “handsome silk dressing gown of rich Persian pattern.” Albert Bigelow Paine, Mark Twain, a Biography: The Personal and Literary Life of Samuel Langhorne Clemens, Volumes III-IV (New York: Harper, 1912), 1267. 2 Mark Twain, Autobiography of Mark Twain: The Complete and Authoritative Edition, Volume III (Berkeley, University of California Press, 2015), 102. 3 Samuel Clemens to Alfred Arthur Reader, 4 March 1882, in Victor Fischer and Michael Barry Frank, editors, Mark Twain’s Letters, Volume 4: 1870–1871 (Berkeley: University of California Press, 1995, 23. 4 “Good-Bye to Mark Twain: The Last Interview,” Hannibal Courier-Post, 3 June 1902, in Gary Scharnhorst, editor, Mark Twain: The Complete Interviews, (Tuscaloosa: University of Alabama Press, 2006), 455. 5 Charles Neider, editor, The Complete Essays of Mark Twain (New York: Da Capo Press, 2000), 533. 6 Chris Wrigley, Winston Churchill: A Biographical Companion (Santa Barbara: ABC-CLIO, 2001), 130. 7 Michael Patterson, Personal Accounts of the Great Leader at War, (Ann Arbor: F+W Media, 2005), 23. 8 John Colville, Footprints in Time: Memories (London: Michael Russell, 1984), 105-06. 9 Richard M. Langworth, editor, Churchill by Himself (New York: Public Affairs, 2008), 353. 10 Gerald Pawle, The War and Colonel Warden (London: Harrap, 1963), 239. 11 Resa, Willis, Mark & Livy: The Love Story of Mark Twain and the Woman Who Almost Tamed Him (New York: Scribner, 1992), 84. 12 Fred Kaplan, The Singular Mark Twain: A Biography (New York: Random House, 2010), 326. 13 Mark Twain, The Celebrated Jumping Frog of Calaveras County, 30. 14 Paul Fatout, editor, Mark Twain Speaking (Iowa City: University of Iowa Press, 1976), 465. Langworth, Churchill by Himself, 536. 15 Clemens later observed that he “lectured and robbed and raided for thirteen months” to pay his bills. Tom Quirk, Mark Twain and Human Nature, (Columbia: University of Missouri Press, 2011), 222. 17 Mark Twain, Following the Equator: A Journey Around the World, 660-61. 18 Winston S. Churchill, London to Ladysmith Via Pretoria (London: Longmans, 1900) 89-90. 19 Churchill and Twain at the Waldorf: An Original Invitation Card,” Chartwell Booksellers, New York, http://bit.ly/2HeBQN9. 20 Mark Twain, dinner speech, 22 September 1872, in Fatout, Mark Twain Speaking, 69. 21 Samuel Clemens to Olivia Clemens, 28 September 1872, in Kaplan, The Singular Mark Twain, 281. 22 Douglas Grant, Twain, (Edinburgh: Oliver & Boyd, 1962), 57. 23 Fatout, editor, Mark Twain Speaking, 562. Langworth, Churchill by Himself, 125. 24 Albert Bigelow Paine, editor, The Writings of Mark Twain, Volume 35, 702. 25 Winston S. Churchill, My Early Life (London: Thornton Butterworth, 1930, 375. 26 Fatout, Mark Twain Speaking, 367-69. Almost a month later, Churchill granted an interview in Michigan to a young law student in which he echoed Clemens’ comments about the advantages of the Anglo-American connection: “It is an enormous commercial advantage for the United States and Great Britain to speak the same language. It is a tremendous advantage in the way of trade. The same books can be read by twice as many people—a writer or an actor has two reading publics to appeal to. What fools we should be were we to allow our languages to drift apart! I should hope before I die to see an International Society between these two English speaking countries whose object it would be to keep the language together, each year to take certain expressions into the language‑like the Academie Francaise—to incorporate certain changes as are necessary to a healthy principle of growth in the language and to procure uniformity. Otherwise, we will lose our unity of language….there is danger of our drifting apart and losing our common tongue, by making it too common.” Gustavus Ohlinger, “Winston Spencer Churchill: A Midnight Interview,” Michigan Quarterly Review, February 1966. http://hdl.handle.net/2027/spo.act2080.0005.002:02. 28 Clemens recalled: “I was a soldier two weeks once in the beginning of the war, and was hunted like a rat the whole time. Familiar? My splendid Kipling himself hasn’t a more burn’t in, hard‑baked and unforgettable familiarity with that death‑on‑the pale‑horse‑with‑hell‑following—after which a raw soldier’s first fortnight in the field—and which, without any doubt, is the most tremendous fortnight and the vividest he is ever going to see.” Mark Twain, The Private History of a Campaign That Failed. http://www.classicshorts.com/stories/phctf.html. 29 Jonathan Rose, The Literary Churchill: Author, Reader, Actor (New Haven: Yale University Press, 2014), 22. 30 The New York Times, 13 December 1900, quoted in Mark Zwonitzer, The Statesman and the Storyteller: John Hay, Mark Twain, and the Rise of American Imperialism (New York: Algonquin Books, 2016), 414. 31 Robert H. Pilpel, Churchill in America, 1895‑1961: An Affectionate Portrait, (New York: Harcourt, Brace, Jovanovich, 1976), 40. 33 Churchill, My Early Life, 376. 36 David Lough, No More Champagne: Churchill and His Money (London: Picador, 2015), 262-65. 37 Churchill to his mother, 1898: “We both know what is good, and we both like to have it,” Martin Gilbert, Churchill: A Life (London: Minerva, 1992), 85. 38 Michael Shelden, Mark Twain: Main in White: The Grand Adventure of his Final Years, (New York: Random House, 2010), xxxv. 39 Ron Powers, Mark Twain: A Life (New York: Free Press, 2005), 323. 40 Mary Soames, “Winston Churchill: The Great Human Being,” in R. Crosby Kemper II, editor, Winston Churchill: Resolution, Defiance, Magnanimity, Good Will, (Columbia: University of Missouri Press, 1995), 197. 41 Sarah Churchill, Keep on Dancing (New York: Coward McCann, 1983), 184-85. 42 Mark Twain, Autobiography, Volume III, 312. 43 Caroline Thomas Harnsberger, Mark Twain: Family Man (New York, Citadel Press, 1960), 69. 44 Clementine Churchill to Winston Churchill, 15 August 1944, in Mary Soames, editor, Winston and Clementine: The Personal Letters of the Churchills, (New York: Doubleday, 1998), 498. 45 Powers, Mark Twain, 423-24. 46 Churchill, London to Ladysmith, 150. 47 Peter Messent, The Cambridge Introduction to Mark Twain, (Cambridge: Cambridge University Press, 2007), 22.